Galaga will only play on a PC with flash installed. However, don't disappear! You can play the free game Galactians above which works on all devices. Galaga is the shoot-em-up arcade sequel to Galaxian (1979) that was originally developed and published by Namco (in Japan) and Midway in North America in 1981. There were many extra features in the game compared to Galaxian. The game was later ported to the Atari 7800 console, Famicom, Game Boy, MSX Computer, NES and Tandy TRS-80 Color Computer. More recently it was ported to the Xbox 360. 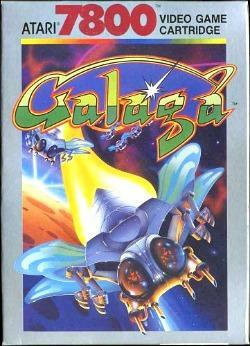 The game was released as a sequel to Galaxian which was released in 1979, and boasts several improvements. The basic game-play involves swarms of insect-like aliens that fly in formation and sometimes swoop across the screen and try to collide with your spaceship and fire at you. Advances in technology and programming meant you no longer had to wait for one bullet to disappear before you could fire another one. In other words, you could fire more than one bullet at a time! The free online flash version below is actually called Galagon 2004, but is more or less the same as the original Galaga. INSTRUCTIONS: Click on the game and the use the arrow keys to select Play Game and press the spacebar to get started. You control your spaceship using the left and righ arrow keys and press the spacebar to fire. Just blast everything in sight! The Atari 7800 game cartridge was released in 1987 and was not available on the Atari 2600 or 5200 consoles.